Annuities have fallen out of favor with many financial advisors and their clients, so the Alliance for Lifetime Income – a new non-profit membership organization for sellers of annuities – aims to combat that trend. To that end, on Oct. 4, marketers for the Alliance, which counts AIG and Prudential among its corporate members, managed to squeeze a marketing vehicle into a busy Times Square spot. They parked the truck on 45th and Broadway in Manhattan, plastered its sides with its marketing campaign’s slogan “Retire Your Risk,” and, for at least part of the morning, stocked it with insurance company executives, including Jana Greer, the CEO for AIG’s Individual & Group Retirement Division. The fanfare in Manhattan — scheduled for more destinations nationwide later this month – was intended to help unveil the Alliance’s new campaign and online software tools to reintroduce annuities, including variable annuities, to financial advisors, their clients, and directly to retirees. “We have never let a consumer down,” Greer, speaking for the insurance industry, told a group of reporters, whom the Alliance invited for a press conference before Greer made her way to the truck. Plenty of FAs — including Ric Edelman of Edelman Financial Services, David Yeske of Yeske Buie, and Ken Fisher of Fisher Investments — have put themselves on record for opposing that view. "Companies have been canceling products left and right because they don’t live up to the standard of meeting clients’ best interests," Edelman told CNN recently. The group plans to introduce a free online software tool it has labeled the RISE Score Calculator, which will spit out ratings akin to credit scores. Those ratings are supposed to help financial advisors, their clients, and individual investors evaluate the risks of keeping a steady income through their entire retirement. The calculator will let users adjust those RISE scores by adding generic annuity products to the mix. 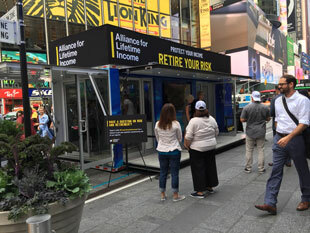 Annuities marketers open popup shop in Times Square. The Alliance also issued this week a study of 3,210 adults aged 24 to 74, which was conducted by a brand strategy communications group. The study’s results showed that only two out of five Americans have protected retirement lifetime income in the form of a pension or an annuity. At the same time, the study showed that only 48% of Americans expected their savings to last their lifetime. The Alliance wants to promote the narrative that annuities address those insecurities, even if they don’t rank as the only or largest asset in a retirement portfolio. The organization wants advisors to know products are available that compensate them through commissions, or on a fee basis — the advisors choose. “We are the facilitators who have the products to pool the risk and very effectively address the issue,” Barry Stowe, the CEO of Jackson National, the insurer, told reporters. The Alliance is “highlighting the issue” of rampant retirement income insecurities and “highlighting the simplicity of the solution,” Stowe added.